3 Reasons to Choose Blackbutt Flooring for Your Home Many people are choosing to install timber flooring in their homes, and Blackbutt timber flooring is a popular choice. Blackbutt flooring is an excellent option for your home because it’s a hard wearing surface that will enhance the appearance and appeal of any property. This durable material will last a very long time; it comes in a wide variety of colours and shades to suit any colour scheme. 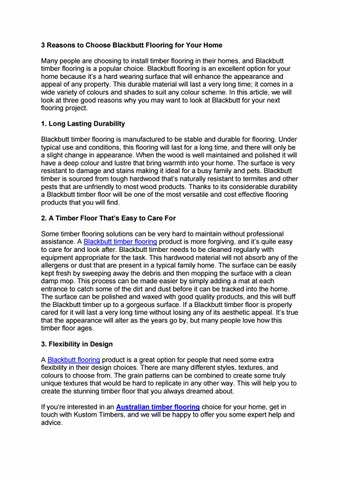 In this article, we will look at three good reasons why you may want to look at Blackbutt for your next flooring project. 1. Long Lasting Durability Blackbutt timber flooring is manufactured to be stable and durable for flooring. Under typical use and conditions, this flooring will last for a long time, and there will only be a slight change in appearance. When the wood is well maintained and polished it will have a deep colour and lustre that bring warmth into your home. The surface is very resistant to damage and stains making it ideal for a busy family and pets. Blackbutt timber is sourced from tough hardwood that’s naturally resistant to termites and other pests that are unfriendly to most wood products. Thanks to its considerable durability a Blackbutt timber floor will be one of the most versatile and cost effective flooring products that you will find. 2. A Timber Floor That’s Easy to Care For Some timber flooring solutions can be very hard to maintain without professional assistance. A Blackbutt timber flooring product is more forgiving, and it’s quite easy to care for and look after. Blackbutt timber needs to be cleaned regularly with equipment appropriate for the task. This hardwood material will not absorb any of the allergens or dust that are present in a typical family home. The surface can be easily kept fresh by sweeping away the debris and then mopping the surface with a clean damp mop. This process can be made easier by simply adding a mat at each entrance to catch some of the dirt and dust before it can be tracked into the home. The surface can be polished and waxed with good quality products, and this will buff the Blackbutt timber up to a gorgeous surface. If a Blackbutt timber floor is properly cared for it will last a very long time without losing any of its aesthetic appeal. It’s true that the appearance will alter as the years go by, but many people love how this timber floor ages. 3. Flexibility in Design A Blackbutt flooring product is a great option for people that need some extra flexibility in their design choices. There are many different styles, textures, and colours to choose from. The grain patterns can be combined to create some truly unique textures that would be hard to replicate in any other way. This will help you to create the stunning timber floor that you always dreamed about. 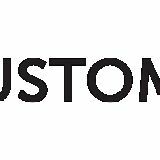 If you’re interested in an Australian timber flooring choice for your home, get in touch with Kustom Timbers, and we will be happy to offer you some expert help and advice.